On February 11, 2008, the Sioux Falls, South Dakota school board approved a Spanish Immersion Program to begin Fall 2008. I was elated. As a former French immersion kindergarten and first grade teacher in Edina, Minnesota, I know the incredible benefits of the immersion experience. Sioux Falls administrators, who had researched the language immersion concept, were convinced immersion is a sound educational model. The next step was to heighten awareness of this unique learning opportunity and to inform the most important audience, our prospective families, about the advantages of immersion education. We gathered research data and planned informational parent meetings. We also realized that testimonials from former immersion students and parents would be important. I contacted my first group of Edina, Minnesota kindergarten students whose immersion experience began in September 1991. These students, as well as their parents, were thrilled for the opportunity to share their reflections; their passion has not dimmed since the program’s inception seventeen years ago. A parent, John Crist, and a retired administrator, Lily Schroeder, from the Edina French Immersion Program willingly gave of their time and drove 270 miles from Minneapolis to Sioux Falls to present at the parent informational meetings. 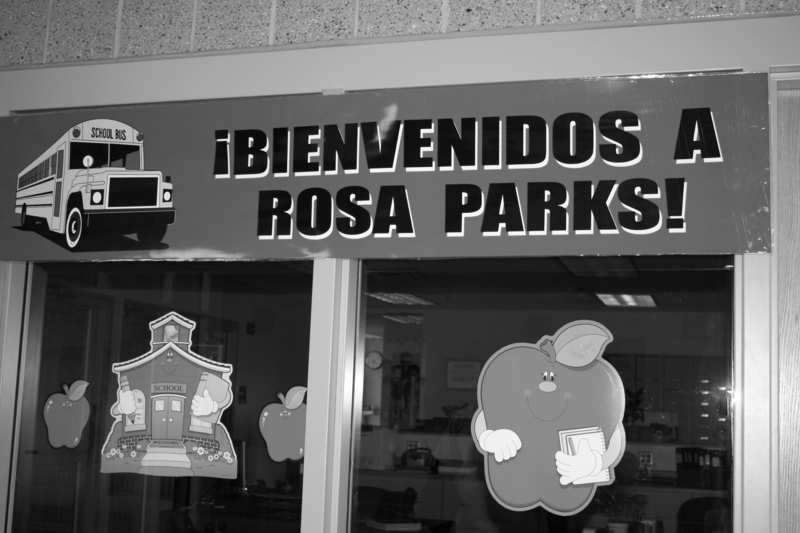 The New Rosa Parks Spanish Immersion School in Sioux Falls, SD. The first class of Kindergarten French Immersion students in Edina, MN is now graduating from college—some have graduated a year early. One student will graduate with a chemical engineering degree and minors in Japanese, Asian Studies and Environmental Studies. Another student majored in International Relations/African Studies and is currently working at a refugee resettlement organization in Austin, Texas using French daily. Now, in graduate school early, her goal is to work in an international organization in a francophone African country. In fact, many students are multilingual. Languages studied, in addition to French, are Arabic, Hebrew, Japanese, Korean, Latin, and Spanish. Other immersion students pursued majors and career goals in Spanish, Japanese, French/psychology, French/child psychology, economics, teaching careers in languages, ESL education in francophone countries, and Japanese translation. Numerous accomplishments are evidence of the graduates’ successful college careers: invitations to honor societies, scholarships, foreign exchange programs and internships abroad; many students have already studied and lived outside the U.S. (Kenya, France, Spain, Costa Rica, Japan, India, Asia, Australia, and South America) before completing their undergraduate degrees. Testimonials from former immersion students and their parents can be a powerful tool in promoting immersion education. We prepared testimonial packets for distribution at our Sioux Falls parent informational nights. They proved to be persuasive in convincing the Sioux Falls parents to enroll their children in our language immersion program. Parents of immersion students were asked to reflect on why they chose immersion, what they saw as the benefits of an immersion education, and in short, why immersion education was a good choice for their child. The following statements summarize views on language immersion from parents whose children completed a K-12 French Immersion Program and are now graduating from college. Make ... friends from various cultures. Have a sense of familiarity and ease with French. Study other languages (Spanish, Latin, Arabic, Hebrew, and Japanese). Approach language study, in general, in a different way. Cultivate a passion for languages. Travel/live in French speaking countries. View the world, other cultures, and other languages in a greater depth. Fulfill language requirements, enabling me to finish early/save money. Clearly, the language immersion program (K-12) has positively influenced these college students’ lives, their interests, and their future goals and pursuits. For many of these students, the immersion experience was just school. School was French and English, and that was their lives. Their bilingual education was neither awkward nor burdensome to them; it was their schooling experience. It is interesting to note that some immersion graduates are just beginning to realize that being bilingual is truly “a bonus.” Now, as they enter into the workforce, surrounded by monolingual peers and co-workers, they are gaining a deeper appreciation for their language skills. One college student wrote, “…just the other day, I even thanked my mom for sending me to an immersion school.” The comprehension of this gift of bilingualism is beginning to take root for many students. In summary, starting up the first language immersion program in South Dakota, in a community with limited exposure to immersion education, has provided us with the opportunity to introduce the benefits of immersion education. Experience breeds confidence. For a new program, we found that by drawing on the experience from Edina, Minnesota’s French Immersion program of seventeen years, we were able to build that confidence from the student/parent testimonial packet and parent presentations. The testimonials gave credibility to the immersion research, and gave the Sioux Falls parents confidence in immersion education. Though more subjective in nature, the sharing of information on Minnesota immersion graduate students and their testimonials has proven to be a powerful education tool in promoting immersion education in South Dakota. Here in Sioux Falls, we look forward to the future where, in the words of an immersion parent: “knowing a second language and the personal discipline required to acquire it are good companions on a life’s journey.” Let the journey begin!